McConnell Cabinets has revamped its entire operation - from production through assembly - to improve the quality of its mass-produced custom and semi-custom kitchen and bath cabinetry. With more than a half-century of success behind it, McConnell Cabinets could have continued with its tried-and-true methods of mass producing custom and semi-custom kitchen and bath cabinetry. But the City of Industry, CA-based company knew that in order to remain competitive in the tract housing market, it would have to be proactive and automate - every step of the way. McConnell Cabinets has since invested thousands of dollars to improve the quality and consistency of manufacturing at its facilities. Changes have already been implemented in the production, assembly and packaging lines. The final phase will be completed later this year and includes revamping the finishing operation. With 499 employees, McConnell Cabinets is the largest California-based manufacturer that designs, builds and installs cabinets for the tract home market. 1. McConnell Cabinets has revamped its production and now has two throughfeed boring lines to produce all its parts. Changes also were made to the product line to increase efficiency. 2. Five new 85-foot automated assembly lines and a 200-foot packaging line have led to significant reductions in the handling of parts. 3. McConnell Cabinets is in the process of switching its finishing system to a Cefla UV flatline operation. "We've flipped the plants 180 degrees from where we've always been to where we are now. Our desire to increase the quality of our products through consistency (in manufacturing processes) has led to us making these changes," says Hank Sarrail, owner and vice president of manufacturing. Although the company specializes in new construction tract housing, each order is unique. "At one time, the business used to be to just offer one door style, one color..." says William Scott McConnell, owner and president. "Today, we manufacture to the builder's option, with each cabinet customized." The majority of cabinets produced are face-frame; the company's Full Access frameless line accounts for 20 percent of the mix. Combined, the company currently manufactures an average of 1,000 cabinets per day, with a capacity of 1,600. To improve consistency and consolidate machining operations in both its frame and frameless lines, McConnell Cabinets focused its attention on its production methods, Sarrail says. "After looking at our operation as a whole, we found a lot of extra handling in all departments. If the operation did not add to the quality or value of the product, we redesigned the process," he adds. Employee input was integral, Sarrail says. The company was able to draw upon a wealth of experience by its 499 employees; 96 have been with the company 10 or more years, 58 for 20 or more years and eight for 30 or more years. McConnell Cabinets manufactures face-frame and frameless cabinets for new construction and remodeling markets. Pictured above is a European beech face-frame cabinet in a cherry finish. "The employees in the plants were very helpful. They looked at every aspect of production, from the material coming in to the product going out," Sarrail says. Almost immediately, the company found it could consolidate cutting operations and reduce storage needs by standardizing stock material for its cabinets to precut sizes. The next operation targeted was the machining process for frame cabinets. One of the first changes implemented was to run all frame parts through a Weinig CNC moulder. In addition to the consistency immediately obtained from the programmable settings, the CNC moulder "eliminated all the mill marks, which reduced the need for additional sanding operations down the line," McConnell adds. Parts now are sanded just twice prior to finishing, first through a four-head Timesavers, then through a DMC to remove crossgrain. "We've reduced our sanding operations, while our quality and consistency are twice what we had before," says Bob McManus, general manager. To speed up the production process, in late 2003 McConnell Cabinets redesigned the construction method for its face-frame cabinets. Among the changes was the switch from dowel to screw construction. "We were boring the dowel holes for the stiles and rails, inserting the dowels by mallet, then clamping the frames to square them up," Sarrail says. "When we changed the way we made the frames, we found a machine that drills a pocket for the screw. It's more consistent and a much faster process." The company also developed a unique way to manufacture its frameless line. 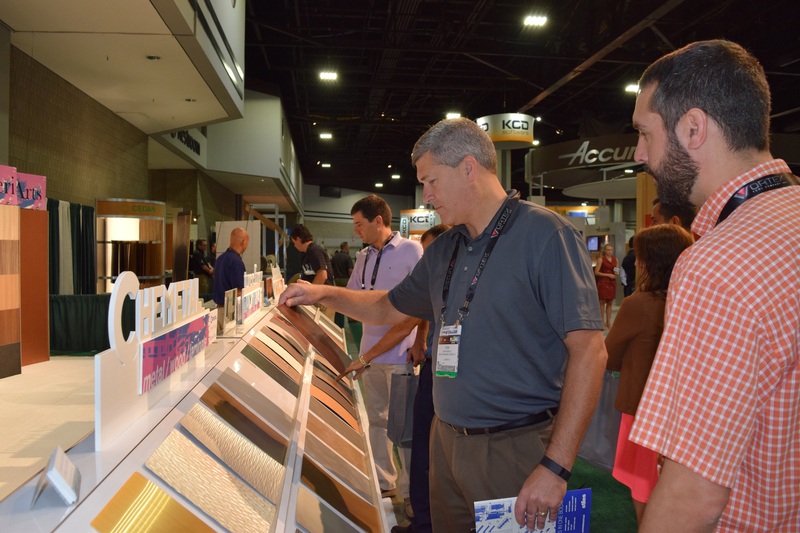 "Since we debuted our Full Access line in 2000, frameless cabinetry has become a growing business," says Jim Ewing, sales manager. However, he says, because of the company's unique requirements for mass customization, the traditional method of 32mm boring was ineffective for McConnell Cabinets' needs. McConnell Cabinets' Full Access line is available in a variety of styles and finishes, including high-gloss white. Frameless cabinetry accounts for 20 percent of McConnell Cabinets' production. "The problem with doing such a high quantity of custom cabinets is that we either would have had to add more point-to-points or do something different," Sarrail adds. Different became the operative word. McConnell Cabinets not only reconfigured its boring lines to include traditional stand-alone machines, but it changed all the processors to Allen-Bradley so the machines could be linked. A bar code system soon will be implemented to aid tracking and ensure order accuracy, McConnell says. Panels first are cut to standardized sizes on one of two Schelling CNC panel saws and stacked. As orders are placed, Heian stackers load panels onto the machining line. Panels are sent to a Powermatic table saw, cleaned, then run through a Biesse RBO panel turner and the first of two Biesse Techno boring machines with modified heads for flexibility. "We had tooling customized for the different boring patterns," says Sarrail. The customized heads are also adjustable to height and depth. The two 106-foot lines are similar, although one has the added capability of dowel insertion. Only one operator is needed to run either line. "With our old method, the time for boring end jambs for the base cabinets was one minute per panel on the single point-to-point. On the new throughfeed boring line, we can do 10 to 15 per minute," Sarrail says. The company's original boring machine, a Biesse Rover 325, is now used for one-up jobs. Homag and Holz-Her edgebanders are used to apply banding to the panel edges. The company also changed the drawer construction in its face-frame line to match the Full Access frameless line. The reason, McConnell says, was "to increase the quality of our product through consistency." An average of 1,450 drawers are manufactured per day. The majority of cabinet doors - 95 percent - also are manufactured in-house. "Our door styles, as well as the species, dictate our price points," says Ewing. Ranked highest to lowest by price point, the species used at McConnell Cabinets are: Lyptus (special orders), hickory, cherry, maple, European steamed beech and oak. Beech is the most popular species requested, followed by oak. McConnell Cabinets produces 1,540 doors per day in approximately 40 styles and finishes. Thermofoil doors are outsourced from Decore-ative Specialties. Two Schelling CNC panel saws cut sheets to specified widths. As part of its efforts to improve consistency and reduce stock, the company has standardized much of its material sizes. One of McConnell Cabinets' goals in revamping its operation was to consolidate all finishing and assembly processes to the Louden plant. Located in Southern California, McConnell Cabinets falls under the jurisdiction of the South Coast Air Quality Management District in regards to VOC emissions. SCAQMD's Rule 1136 is the most restrictive finishing regulation in the nation. Although the company already exceeds the requirements of the July 1, 2005, rule through its use of water-based stains, McConnell says their commitment to a "green" environment has led them to look further for ways to eliminate VOC emissions. "Bob (McManus) and I also spent time looking at some different facilities to see what they were doing and how they were doing it," Sarrail says. Their research led the company to invest in a Cefla flatline and UV coating system. The new line is scheduled to be operational by October. When installed, the finishing process will be: whitewood sanding on the new Opti-Sand sander; application of water-based stain; sanding on a second Opti-Sand sander;application of sealer on the Cefla flatline; a third sanding process; then UV coating of the topcoat on the Cefla system. Akzo coatings will be used in the process. "Our final goal is to have all of our products finished on the flatline system," McConnell says. McConnell Cabinets is in the process of implementing a new Enterprise Resource Planning (ERP) system which will be integrated with Customer Relationship Management (CRM) and Configurator modules that will ultimately change the way the company does business. According to Dave Zander, manager of Industrial Engineering and Material Planning, the Visual Manufacturing Software from Lily will be used for quoting, order entry, shop paperwork, inventory control, shipping and invoicing. The CRM and Configurator modules, from Lily and Experlogix, an affiliate of Lily, will enable the company to program in options and manage builder contracts for both planned and actual deliveries on one order. "Each house is a separate work order, and you might have six houses that make up a shipping group. We wanted a system that would allow us to manufacture all houses for a shipping group as if it was a single work order," Zander says. "Taken as a whole, this will be revolutionary in the cabinet industry - from front end quoting through manufacturing and installation." In addition to changes in the production process, the company has also revamped its entire operation to assemble both cabinet lines in one facility. The five newly-installed 85-foot automated assembly lines and 200-foot packaging line have led to significant reductions in the handling of parts, McConnell says. "With the new redesign of the assembly of our cabinets, we increased output approximately 50 percent, based on having parts in one location. The assembly starts on the conveyor - with all operations done on the conveyor - and the cabinets are transferred to the pre-ship area. When the job is complete, the houses of cabinets are transferred to another power conveyor to be loaded onto the truck. This has removed four-to-five hand movements on the cabinets, reducing any chance of damage," Sarrail adds. Maintaining quality control in all facets of the operation is very important, says John Sarrail, vice president of sales. "For that reason, we deliver and install everything we build." A mass producer of semi-custom and custom kitchen and bath cabinetry, McConnell Cabinets got its start in 1944 manufacturing cabinets, windows and doors. Under the leadership of founder H.C. "Mac" McConnell, his son William McConnell and friend Lou Sarrail, the company gained prominence during the residential development boom that took place in Southern California in the days following World War II. There was a brief three-year period under which the company was owned by Evans Products, but by 1972 it was back in the hands of Bill McConnell and Lou Sarrail. The company thrived for the next 20 years by focusing on mass-produced residential face-frame cabinetry. However, builder demand in the early 1990s had the company expanding into the custom arena. Today, McConnell Cabinets is one of only three companies in the area to supply homebuilders with semi-custom and custom cabinetry on a large scale, with relatively short lead times. Face-frame cabinets currently account for 80 percent of production, although the company's Full Access frameless line, introduced in 2000, is growing. In addition to the two cabinet facilities in Southern California, McConnell Cabinets also operates a sales office in Las Vegas and a laminated panel business, Coastal Wood Products, which it launched in 1990. Combined, the four facilities encompass more than 300,000 square feet of space. In addition to its own products, the company also offers Wood-Mode, Brookhaven, Crystal, Wellborn and Kitchencraft cabinetry for sale in its showroom.